Oldmeldrum is an old established burgh in the Gordon District of Aberdeenshire, on the northbound A947 road from Aberdeen to Banff, approx 16 miles north-west of Aberdeen city. Originally a market centre for the local agricultural community, its population has expanded considerably over the last 20 years with an influx of personnel and businesses associated with the oil industry in Aberdeen . 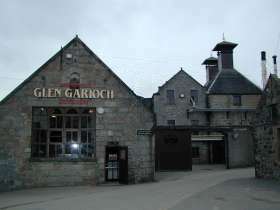 The town has a well-known distillery, which produces the excellent Glen Garioch malt whisky. For the visitor to the area, there are two local golf courses, Oldmeldrum G.C. and Meldrum House G.C. nearby, and also local facilities at Lochter Fishery for trout and salmon fishing. Oldmeldrum has three hotels, a number of Guest houses and B&B's, and is central to the Castle Trail. Historic Scotland , National Trust for Scotland and even a few independent Castles open their doors and gardens from Easter until October and special events and musical evenings are very popular. Close by at Daviot and Inverurie there are pre-historic standing stones. In June each year is held the Oldmeldrum Sports, a very entertaining spectacle on the Scottish highland games circuit, while in August there is a vintage car rally. Oldmeldrum is very much a community town, many people helping to plant and maintain the baskets and tubs providing colourful displays throughout the summer months. Even in winter, the Christmas lights and decorated shop windows create a welcoming festive atmosphere. The Meldrum Online Website has more information on all the clubs, societies, organisations and projects. The Rotary Club of Oldmeldrum has excellent links with local education, especially with the recently constructed Meldrum Academy, which is a six year comprehensive New Community School built to cater for the educational needs of the area and accommodates 1000 pupils from the twelve associated primaries, Barthol Chapel, Cultercullen, Daviot, Logie Durno, Meldrum, Methlick, Old Rayne, Pitmedden, Rayne North, Rothienorman, Tarves, Udny Green.